A few of the murals at Mural Alley located at 2707 E. Washington Ave. in Madison. 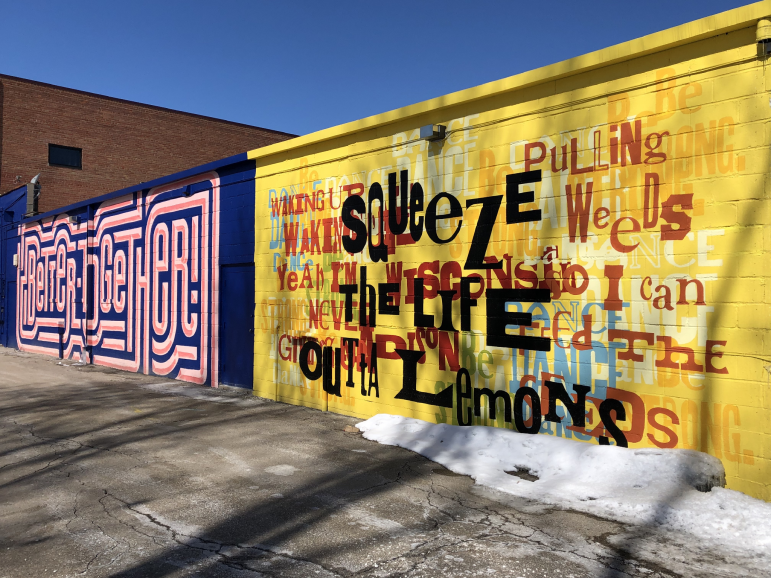 As the weather gets warmer, those looking to enjoy art and fresh air can find a variety of murals around Madison. Our interactive map below locates where to find these murals, and charts a great art-inspired walk or bike ride around town. With your help, this interactive public arts map can be an ongoing project. If you know of any other murals in the Madison area, please email madcommartsmap@gmail.com. In your submissions, please provide any or all of the following: mural title, artist, year, address/location, a brief description and a photo. Southern Rites showcases the photography of University of Wisconsin alum Gillian Laub. The exhibit features Laub’s work from a 2002 assignment in Mount Vernon, Georgia where she photographed segregated proms that were still going on in the area at the time. Curated by University of Wisconsin students, this exhibit explores historic photographs and the elements that were concealed by early photographic processes. What was initially unseen in these photographs will be revealed to viewers by the artists. This collection of colorful, offbeat works demonstrates the style of the Chicago Imagist movement that came about in the 1960s. The artwork often parodies unrealistic body standards promoted by commercial advertising and consumer culture in humorous ways. Artists featured in the exhibit include Barbara Rossi, Sarah Canright, Art Green, Gladys Nilsson, Jim Nutt, Christina Ramberg, Suellen Rocca, and Karl Wirsum. The Mirror Image exhibition is a celebration of portraits. With over 100 pieces selected from the MMoCA’s permanent collection, this exhibit “presents the evolution of the portrait from the early twentieth century to the present.” Portraits featured include works by Gertrude Abercrombie, Henri Matisse, and Diego Rivera among others. Young at Art is a biennial MMoMA presentation devoted to the artwork created by Madison Metropolitan School District students. The exhibition features a wide variety of pieces from students in kindergarten to grade 12 that range from drawing, paintings, sculpture, and more. Shimon Attie: The Crossing exhibition is the product of a partnership between the MMoCA and the Art History course Design Thinking for Exhibitions, at the University of Wisconsin-Madison as taught by professor Anna Campbell. This exhibit will feature the work of the celebrated American visual artist Shimon Attie in the form of an eight-minute video installation demonstrating Attie’s artistic take on the current global refugee crisis. In this exhibit, Tyanna Buie, an accomplished printmaker, offers viewers a look into her childhood memories of growing up in Chicago and Milwaukee during the 1980s and 1990s. Buie represents moments from her youth here through portraits and installations that incorporate photographs, print, collage, and porcelain objects. 2019 marks the third year of The Arts + Literature Laboratory (ALL) Community Supported Arts Program in Madison (CSArt Madison). For this event, which is an effort to promote locally-produced artwork, 1o local artists have been selected to create 61 “shares” of their work. 50 of each artist’s shares will be available for purchase online or in the ALL gallery starting May 1, 2019, which will be distributed to shareholders on June 29, 2019. From June 8 to June 29, ALL will hold an exhibition featuring some larger-scale works of the participating artists. On most Fridays, Saturdays, and Sundays, the UW Cinematheque, a nonprofit theater affiliated with the University of Wisconsin-Madison, shows films that are the "best in international cinema history and...films which would otherwise never reach Madison screens.” Some of the upcoming features include Andrei Tarkovsky’s Andrei Rublev, Abel Ferrara’s Dangerous Game, and Wim Wenders’ Pina 3D. All screenings are open to the public and free, though seating is limited. Select branches of the Madison Public Library will continue to host a variety of film screenings over the coming months that span a variety of genres. Some of the films slated to be screened include the superhero action film Ant-Man and the Wasp, which will be shown at the Alicia Ashman Library on April 26; the 2019 Best Picture Oscar Award-winning film, Green Book, which will screen at the Lakeview Library on April 19; and the Fred Rogers documentary, Won’t You Be My Neighbor, showing at the Central library on April 18. In addition to its upcoming art exhibitions, the community contemporary arts center, will be hosting a variety of performance events over the coming months. Among these events include poetry readings such as the April 13 event Undocumented: Great Lakes Poets Laureate on Social Justice; and musical performances by jazz groups such as the Norwegian drummer Tollef Østvang and his quintet Friends & Neighbors, who will be performing on April 11; Jenny Scheinman & Allison Miller’s Parlour Game, who will bring their eclectic stylings on May 16; and the Keefe Jackson Quartet, whose improvisation-laced show can be seen on May 25. In addition, don’t forget to mark the last Sunday of your calendars in the upcoming months when ALL will hold its New Music Series, a good opportunity to listen to some of Madison’s local jazz talent. Head over to the Barrymore Theatre on Madison’s East Side this spring to experience a diverse range of entertainment. From a face off of two bands paying tribute to English rock legends with the “Beatles vs. Stones: A Musical Showdown” show (April 11), to the awe-inspiring movement art of The Purple Circus (April 20), to a night of Midwestern contemporary folk with Greg Brown (May 11), this venue provides offerings for many different musical tastes. Just a short jaunt from the State Capitol, The Majestic Theatre will host several exciting musical artists in the coming months. The electronic artist Jai Wolf will perform on April 25, the garage rockers known as Black Lips take the stage on April 30, and Saturday Night Live alum Fred Armisen will come to present his musical side on May 18. Also look out for special events at The Majestic like the tribute to jazz legend Louis Armstrong on April 28. The Overture Center’s spring schedule includes performances by the talented pianist Marc-André Hamelin who will be playing with the Madison Symphony Orchestra from April 12 to April 14; the Madison Opera who will be giving performances of Dvořák’s Rusalka on April 26 and April 28; and the celebrated rock band Chicago who will play on May 12. For those who have yet to check out the new Sylvee theater, there will be many good opportunities to do so in the coming months. On April 30, the singer-songwriter Neko Case has a show, the Wisconsin folk punk band The Violent Femmes makes their return on May 18, and, on June 11, the acclaimed indie rock group Vampire Weekend will play. Aspiring artists have the opportunity to come create under the instructed guidance of the Madison Public Library’s current Artist-in-Residence, Taylor Rushing. During April, Rushing will be leading a couple of workshops in whittling and trick carving as well as zine publishing that interested parties can register for now. Twice a year, the MMoCA orchestrates their Gallery Nights. This free event offers lovers of art and culture the opportunity to enjoy displays, lectures, music, and more in the galleries, local businesses, restaurants, cafes, and museums. Taking place over the course of Memorial Day Weekend, Brat Fest promises a wide variety of activities. In addition to a full lineup of live musicians, including a carnival, good food, games, a 5k Hot Dog Jog, and fireworks. Of course, there will also be plenty of brats to go around as well.